I'm so excited to share this recipe with you after such a long break. I've had a lot of changes in the last couple of years, including a new job and a brand new baby boy, the light of my life, who will turn 4 months old in just a couple of weeks. I've been busy, very busy, and exhausted, but finally see the dust beginning to settle a little. For the first time in ages, I actually feel inspired to make new recipes and share them. Cooking has always been a big creative outlet for me, and with the demands of being a new mom, I find it gives me a little piece of ME back...a no-makeup, spit-up covered me, but me nonetheless. 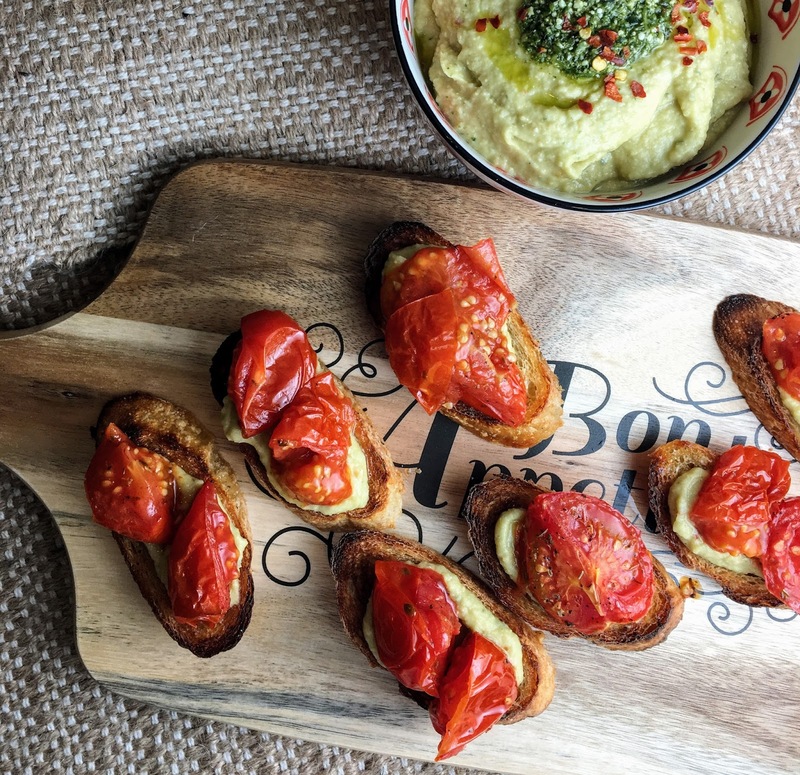 This recipe combines some of my most favorite things: bread (I could and often do just live on bread), hummus, and roasted tomatoes. I've been on a roasted veggie kick since right before having the baby. I wanted a way to keep up on eating healthy without spending a ton of time, and have taken to roasting a bunch of different veggies on the weekend and then reheating throughout the week. 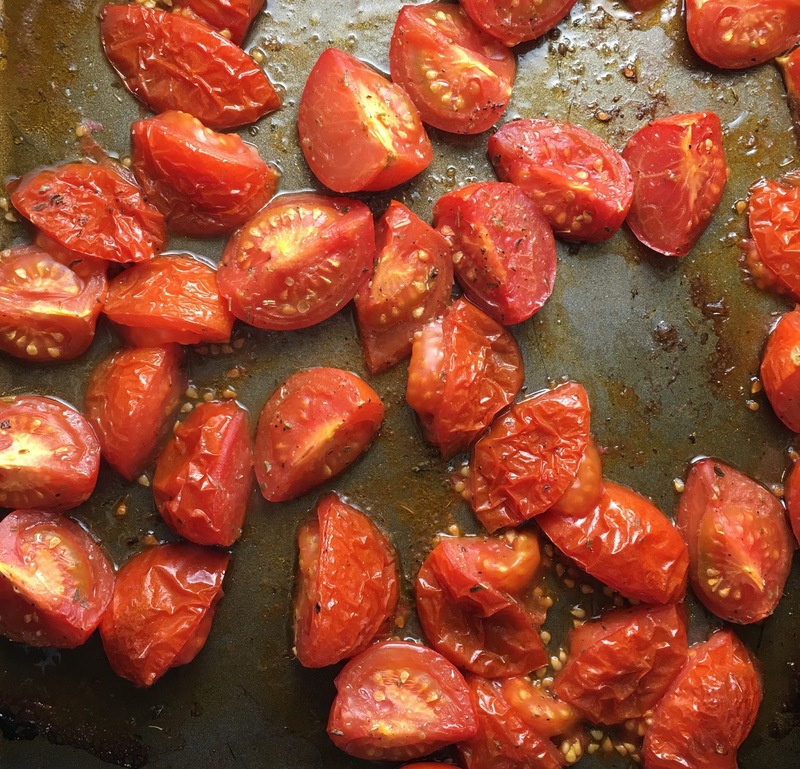 Roasted tomatoes are one of my favorites and are a great way to add flavor and freshness to pasta, burritos, rice, what-have-you, so when I came across THIS recipe on Recipe Runner via Pinterest I got really excited. I like to make my own hummus, and roasted my tomatoes a little differently, so here's my take on it. 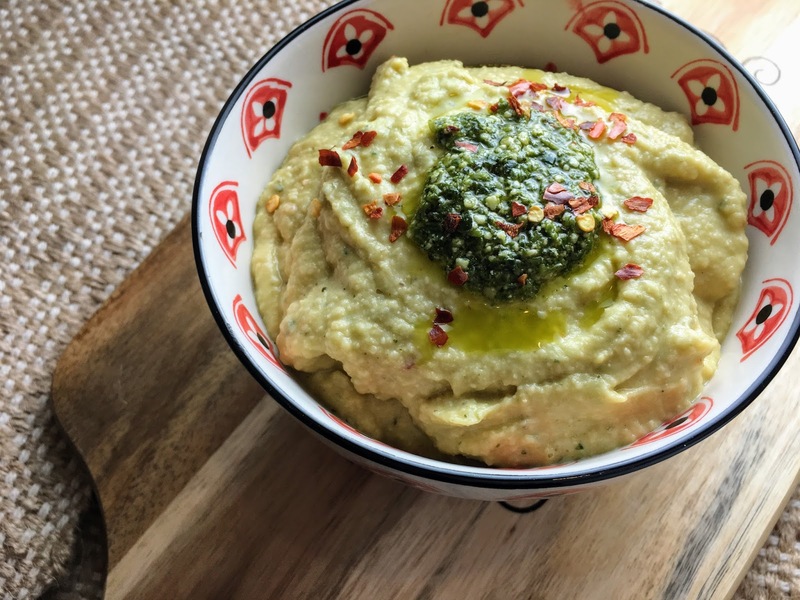 This recipe is kind of two recipes in one: the crostini all put together, and the pesto hummus. I will probably make a separate blog post just for the hummus, so it's easy to find later, but for now I'll just separate them on the page. This hummus has the same base as my Spicy Hummus recipe with a few changes. It's super simple to make: just toss all of the ingredients into a food processor or blender and blend together until it's your desired consistency. The only thing to really be mindful of here is to use organic garbanzo beans if possible. I'm not sure what the difference is exactly, but the organic beans taste so much better. I think it's the liquid they are packed in. Since the beans are the main item here, and you'll be using a bit of the liquid in the recipe, try your best to get organic if you can. Start by pre-heating your oven to 425 degrees F. While that's preheating, wash and quarter your tomatoes. I've been really into the Campari brand greenhouse cocktail tomatoes that are still on the vine. They are so flavorful and somewhere inbetween a grape tomato and a regular tomato in terms of size. Here's a link if you want to see what I'm referring to (they are not a sponsor or anything, I just like their tomatoes). If you are using cherry or grape tomatoes that's fine too, you can just cut them in half or even leave them whole. Place them in a pan and toss with olive oil, a generous pinch of salt, pepper to taste, and some shakes of dried oregano. I know this is not measured or scientific, but it's really to taste. I put estimates in the ingredients below. Feel free to use a sheet of parchment paper if you prefer not to have to clean up as much after - just make sure it's suitable to the temp you're cooking at. Bake for 18-20 min and that's it! I really like them to kind of obliterate in the oven, so they melt in your mouth (careful they may drip!). However, you could check them earlier if you want them to be less...obliterated. Also, I use a dark roasting pan. I've tried similar recipes in a lighter pan or even glass and it doesn't come out quite the same. Time to put it all together! Start by slicing your baguette on a diagonal. We only used about half of the baguette and had tomatoes left over, so I think you could use the whole baguette. Drizzle each side with olive oil, then place them on a baking sheet and broil for a few minutes. Be really careful not to forget about them! You might have noticed that the slices in my pictures are a tad on the dark side. My mother would call those"nice and golden brown," which means "almost burnt, but I love you and I'm going to appreciate your cooking anyway." And I chose the least burnt ones for the picture. No need to flip them. I think they get too crunchy that way. If you prefer, you can also cook them in a skillet or on a grill pan - if so, you will probably want to cook them on both sides. 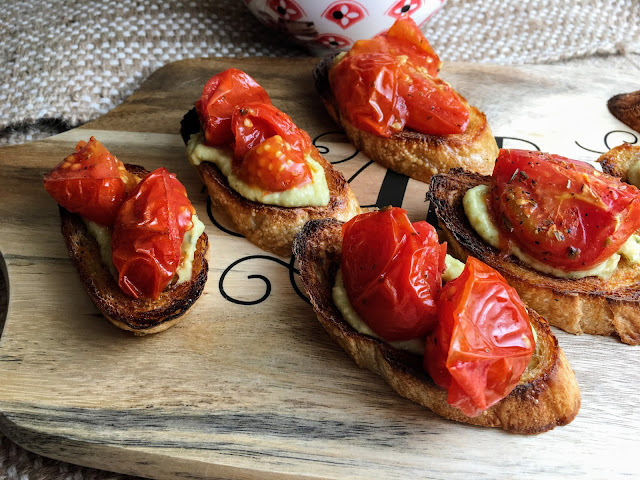 Once they are to your desired toastiness, take them out of the oven, top with pesto and roasted tomatoes and serve right away. I promise these will be a big hit, and you will have leftover hummus for dipping extra bread, pita chips, veggies, or just to make more crostini. I didn't try it last night, but I think the crostini would be really good with the pesto hummus and topped with feta cheese and kalamata olives. Hmmm I might have to make another blog post for those in the future. Thanks for reading my blog! For more yummy recipes, check out the links on the side and top of the page. Don't forget to follow, share, and enjoy!